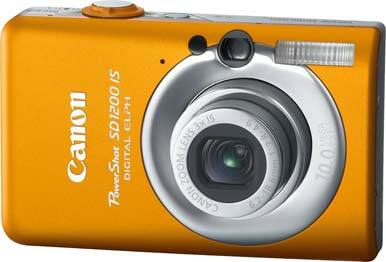 Canon’s PowerShot SD1200 IS is pocketable, has an interesting variety of shooting modes, produces very good image quality, and comes equipped with optical image stabilization. I found a few design flaws, however, and image quality did suffer with certain manual settings. The SD1200 IS received a Very Good rating in our lab’s jury tests for imaging quality, earning particularly high marks in terms of lack of distortion, color accuracy, and overall exposure quality. The SD1200 IS doesn’t have much in terms of wide-angle capabilities or optical zoom range, as its bare-bones 3X optical zoom reaches from 35mm on the wide-angle end to 105mm telephoto. The button layout is typical of Canon point-and-shoots, with a switch for toggling between three shooting modes (automatic, program/scene, and video) and, to the left of it, a play button for reviewing photos. Beneath those buttons is a four-way directional pad with a center button, as well as dedicated buttons for the display (for controlling text that appears on the LCD) and the menu. While the button organization is easy enough to figure out, I had a few design-related gripes. The buttons are flush with the body of the camera, which makes them difficult to press. In additon, the camera’s optical viewfinder, which is nice to have in theory, was simply too small to be of use. Normally, I find a viewfinder quite handy, especially when shooting outdoors when it is difficult to see the LCD screen. During my hands-on tests, I found myself wishing that Canon had either increased the size of the 2.5-inch display or gotten rid of the viewfinder altogether. Navigating the menu is straightforward, but I was a bit confused when shuffling through the shooting modes. Pressing Func Set displays five shooting modes along bottom of the screen, and it took me a second to figure out where the rest were hidden. It isn’t until you highlight the last shooting mode listed that you’ll see “DISP” pop up next to the mode name, indicating that you have to press that button to view the rest. The 10-megapixel SD1200 IS has as solid feature set for a novice photographer who’s ready to move beyond snapping photos in automatic mode. Even so, the SD1200’s Smart Auto mode produced decent images, particularly outdoors. Colors looked vivid and accurate, and exposure, for the most part, was good, though sometimes details were a bit blown out. The SD1200 has 18 shooting modes. The Aquarium setting, for example, lets you snap photos of sea creatures without the annoying glass glare that often plagues such pictures. In my casual hands-on tests of a friend’s 40-gallon fish tank, I found this setting quite effective. The camera also has an Underwater mode (which you must use with the proper waterproof casing), plus Fireworks, Foliage, and Beach modes, among others. Shooting in program mode gives you a little more control; you can adjust ISO, light metering, focus, white balance, and color effects manually. Going above ISO 200, though, isn’t recommended: In my casual tests, I found that my images became grainier and lost detail the higher I went. The PowerShot SD1200 IS has a 2.5-inch LCD. The SD1200 IS has a variety of white-balance settings (Daylight, Cloudy, Tungsten, and Fluorescent, to name a few). I was very pleased with the quality of my photos using these settings, particularly the Fluorescent mode. Shooting under fluorescent lighting generally results in overexposed highlights and blown-out details, but the Fluorescent mode prevented this. In our lab’s battery life tests, the SD1200 IS received lasted 352 shots on a single charge. That’s in line with the battery life of some of the better point-and-shoots we’ve seen over the past few years. As with most cameras that have rechargeable lithium ion batteries, you need to remove the battery to recharge it. The ultracompact SD1200 IS comes in six eye-catching colors (silver, dark gray, pink, blue, green, and orange). It measures 3.5 by 2.2 by 0.9 inches—about the size of a deck of cards—and weighs in at 4.2 ounces. It connects to your Mac via USB and photos can be imported into iPhoto easily. For the price, the SD1200 packs in the right amount of features for casual photographers. More-experienced photographers will be pleased with the image quality, but the lack of aperture and shutter priority, plus the limited zoom range, may leave them wanting a bit more.